(Montréal, Oct. 1, 2018) The Scoitabank Giller Prize has announced that SONGS FOR THE COLD OF HEART is one of 5 finalists for the Giller Prize. 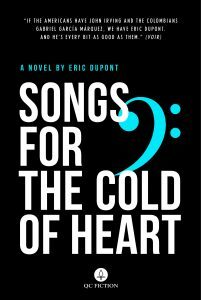 Baraka Books would like to formally congratulate Eric Dupont, author of Songs for the Cold of Heart, and Peter McCambridge, who translated the novel and is also fiction editor at QC Fiction. The Scotiabank Giller Prize is the top literary award in Canada and it is a great honour to be on the shortlist. Originally published by Marchand de feuilles of Montreal as La Fiancée américaine, Songs for the Cold of Heart was an immediate bestseller in French. It is a feat of storytelling and a solid fit with QC Fiction’s mandate of bringing beautifully written, page-turning stories to readers around the world. QC Fiction has published three novels in translation a year since the adventure began in June 2016 with Eric Dupont’s Life in the Court of Matane (also translated by Peter McCambridge). Two of its first 7 books have drawn praise from Canada’s leading literary awards: first Katia Grubisic’s translation of Brothers by David Clerson, a finalist for the 2017 Governor General’s Literary Award for Translation, and now the Giller shortlist for Songs for the Cold of Heart. Baraka Books and QC Fiction thank the SODEC for support in funding part of the translation and the promotion, the Quebec Government for its tax credit program, the Canada Book Fund for support in our publishing program and the Canada Council for supporting our Literary Publishing Project. QC Fiction is an imprint from Baraka Books of Montreal. It brings readers of English around the world the very best of a new generation of Quebec storytellers, sharing surprising, interesting novels in flawless English translation from a new generation of translators. Baraka Books is a Quebec-based English-language press publishing progressive books with an accent on Québec. The 2018 Scotiabank Giller Prize jury announced its shortlist on Monday, October 1, 2018. The five titles were chosen from a field of 104 books submitted by publishers all across Canada. Jury members were Heather O’Neill, John Freeman, Kamal Al-Solyalee (Jury Chair), Maxine Bailey, and Philip Hensher. The winner will be announced on November 19.